Mexican food in a bowl, yum! Our Mexican Buddha bowl is rich in protein and ingredients that will benefit your gut and is seriously delicious. The recipe is simple to make, and in fact, is a great idea for anyone who does meal prepping as it can be made in advance. The grass-fed beef mince is cooked along with distinct Mexican spice flavours, namely paprika, cumin and a dash of chilli powder. All this combined with the flavourful goodness of onions, garlic and oregano. This spice mix is combined in a bowl beforehand in order to use some for the roasted sweet potato as well. First, give the sweet potatoes a rinse and dry off excess water, at this point you can either peel of the skins or leave them on. Cut the sweet potato in to bite size cubes and add them to a baking sheet along with the spices and oil. Give them a toss to make sure each cube is coated and pop them into the oven until roasted to perfection. While the sweet potato is roasting you can prepare your other add-ins. For the pickled onions, we would recommend making them at least a day before so they can become a little tender, tangy and this will allow them to turn that beautiful bright pink. The salsa is a simple yet delicious combination of cherry tomatoes, finely diced red onion, coriander and lime juice. Simply add all the chopped ingredients into a bowl with lime juice and set aside until you’re ready to use it. This can also be made in advance. Now for the best part, AVOCADO! Here you can go two ways, either make our scrumptious simple homemade keto guacamole, something we highly recommend. It is great with almost any meal and the benefits make it even more worthwhile. Don’t be afraid to embrace those good fats. The other option is to thinly slice or dice a ripe avocado and serve as is. You won’t be disappointed either way. Some other added extras you could add are thin ribbons of blanched zucchini, wilted baby spinach, or even some steamed organic rice, for those not following a grain free option. We opted for the zucchini ribbons, this versatile veggie is delicious, low carb and rich in fibre, a key to maintaining that healthy microbiome. Accompanied with handfuls of fresh coriander and juicy wedges of lime to bring this well-rounded dish together. Now we saved the best for last. Yes, finish off this heavenly Buddha bowl with our homemade fermented Jalapenos, these spicy gems are naturally fermented which means they are rich in probiotics. 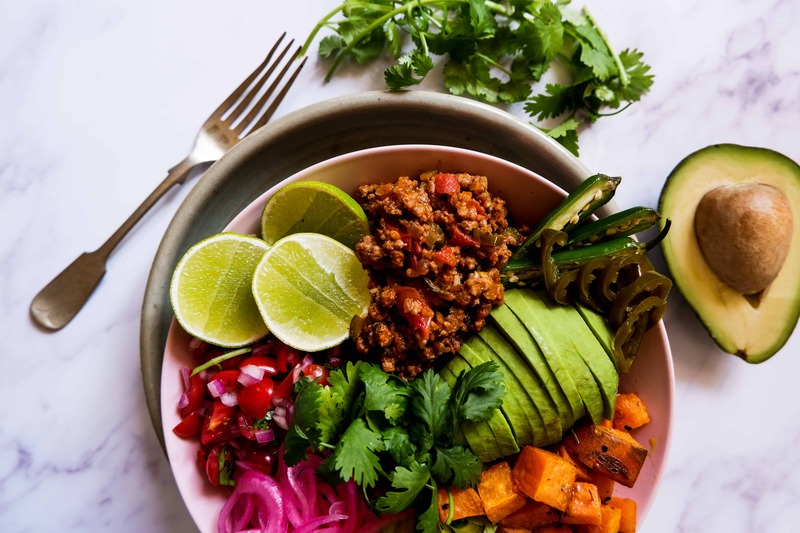 They add a yummy tangy kick to this Mexican buddha bowl, while also benefiting gut health by supplying those vital good bacteria. We hope you thoroughly enjoy this recipe, make it in advance and take it with for lunch the next day or enjoy it for dinner as a nutrient-rich meal that will leave you feeling great. Don’t forget to let us know what you think and tag us in your recipe photos on Instagram, we would love to see them! In a small bowl mix together chilli powder, paprika, cumin, salt, oregano, and cayenne pepper (if using). On a baking sheet, toss sweet potato pieces with the olive oil and half the spice mix from the small bowl. Bake for about 20 minutes or until tender and cooked through. While the sweet potato cubes are roasting, make the Mexican spiced beef mince, cook beef over medium-high heat until cooked through and golden. Add spices that are left, along with the diced onion, and crushed garlic, and continue to cook until the scent of the spiced are released and the onions are tender and translucent. For the Salas: Combine all the ingredients in a small bowl and leave in the fridge until ready for use. For the Pickled Onion: Add the red onions to a small bowl and pour over some apple cider vinegar, until the onions are covered by the vinegar. Ideally, this can be done in advance, the longer they sit the more tender and brighter the onions will be. Now the fun part to build the Buddha bowl, in two bowls add the mince, sweet potato cubes, pickled onion and any of the optional extras of your choice.